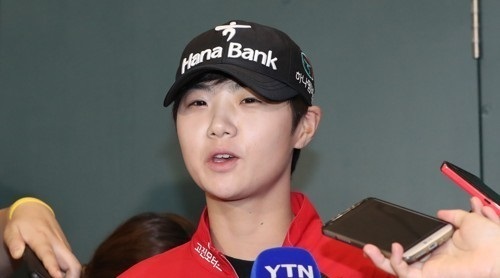 "I want to win again and enjoy the same feelings (from the U.S. Women's Open)," Park told reporters after landing at Incheon International Airport. "I think it's premature to talk about winning the Rookie of the Year because the season is still not finished. I'll just keep trying to do the best I can." Despite Park's claim, she is nearly a lock to win the top rookie honors at the season's end. Park has earned 1,135 points in the Rookie of the Year race so far, with Angel Yin of the United States a distant second at 511 points. Rookies are awarded 150 points for tour victories, 80 points for runner-up finishes, 75 points for third place and so forth. Points are doubled at the five major tournaments. There are 12 tournaments remaining this year, including one major, the Evian Championship, next month in France. Park is second on the money list with US$1.54 million, just behind fellow South Korean Ryu So-yeon, who has made $1.73 million. Park is also No. 2 in scoring average with 69.086 strokes per round. American Lexi Thompson is the leader at 68.983 strokes on average. Park also has an outside shot at winning the Player of the Year. She's currently in fourth place with 100 points, 50 behind the leader, Ryu. Players earn 30 points for each tour victory, 12 points for a runner-up finish and so forth. Points are doubled at majors. Park will actually have to leapfrog two South Koreans to win the top individual honors, as Kim In-kyung, who won the Ricoh Women's British Open last weekend, is in second place with 122 points. Park, Ryu and Kim have six victories among them this year. As a group, South Koreans have combined for 12 wins in 22 LPGA tournaments this year, and are on pace to break the country's single-season record of 15 victories, set in 2015. Park said the excellence of her compatriots never ceases to amaze and also motivate her. Take the U.S. Women's Open, for instance, where there were eight South Koreans inside the top 10. "A lot of the South Korean players provide friendly competition," Park said. "I just can't let up because everyone is playing so well." After winning the U.S. Women's Open, Park credited her caddie, David Jones, for helping her stay loose and calming her nerves during the tense final round. Jones is actually Park's third caddie this year, after Colin Cann and Chris McCalmont. Jones came on board in May and it appears as though he'll be in for the long haul with the 23-year-old. "David really brings out the aggressive side in me, and we work great together," Park said. "Earlier in the season I was frustrated that I wasn't playing the kind of golf I was capable of playing. But now I am really comfortable." With no tour stop this week and the Solheim Cup between the United States against Europe set for next week, South Korean and other international players won't return to action until the Canadian Pacific Women's Open on Aug. 24. During her stay in South Korea, Park said she'll rest just for one day Tuesday and will resume practicing on Wednesday, so that she can maintain her sharp form for the rest of the season. For Park and other stars vying for season-end awards, the Evian Championship will be the last opportunity to pad leads or make up ground. Park said her goal for each tournament is to do better than the previous year. With the Evian Championship, that would mean a victory for Park, as she finished tied for second behind South Korean winner Chun In-gee in 2016.